The nation’s energy infrastructure is getting equipped with millions of sensors — everything from vibration sensors on nuclear power plants to the internet-connected thermostat on the wall of someone’s house — and is starting to produce data on the scale of petabytes (a million gigabytes). Pretty soon, just about everything will be measured, and knowing what to do with all this data with analytics and machine learning is a looming challenge. 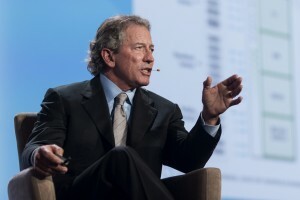 Tech billionaire Tom Siebel on Tuesday announced the formation of the Siebel Energy Institute, which will attempt to tackle the challenge of putting this data to good use. Siebel, who made his fortune with Siebel Systems, an early customer relationship management software company that Oracle bought for $5.8 billion in 2006, is putting in $10 million of his own money into the new institute, which will team up with a number of big research universities: University of California, Berkeley, Carnegie Mellon University, Princeton University, École Polytechnique, University of Tokyo, Massachusetts Institute of Technology, Politecnico Di Torino, and the University of Illinois at Urbana-Champaign. S. Shankar Sastry, the dean of the engineering school at UC Berkeley, will head up this new institute. Two times a year, the institute will hand out grants of between $25,000 to $50,000 for original research proposals into this area. Researchers can then look to raise money from foundations like the National Science Foundation to fully fund their work. The Siebel Energy Institute may continue to fund researchers projects even after the initial investment. “With a modest amount of money, we’ll be able to attract hundreds of millions of dollars in research funding to advance statistical analysis and machine learning as it relates to power systems,” Siebel said in an interview with Forbes on Tuesday. On Tuesday, the first batch of grant recipients was announced. The research proposals span from using smartphones to monitor power grids, to how drones can be used to predict maintenance needs, to figuring out electric vehicle charging patterns. The second batch of grants will be announced in six months and will focus on cyber security, said Siebel, whose net worth Forbes estimates to be $2.3 billion. With better software, utilities could vastly improve the efficiency of the grid, improve its reliability, predict when maintenance is required, and even detect when a hacker tries to penetrate the system. The benefits of this new evolution of the energy grid aren’t likely to happen quickly. In the U.S., it’s especially hard to adopt new technology, with the country’s fragmented utility market — there are around 3,200 utilities across the country. ”U.S. utilities are not leading in innovation,” Siebel said. U.S. rollouts of smart meters, which allow utilities to measure energy usage remotely multiple times a day, remain limited compared to smart meter rollouts across Europe and China. A 2014 report from the Institute for Electric Innovation estimated that there are 50 million smart meters deployed across the U.S. Meanwhile, China is expected to have 500 million smart meters installed by the end of this year. The U.S. grid will need to invest around $2 trillion in infrastructure upgrades, according to a recent report from energy industry research outfit the Rocky Mountain Institute. But Siebel knows as well as anyone how much value better software can bring to an industry. He made his fortune from his hugely successful sales automation software company. Since Oracle bought the company, he’s been putting a lot of his money into philanthropy. Siebel also has skin in the energy game. In 2009, he founded C3 Energy, which sells enterprise software for utilities to manage data coming from the energy grid. The company has raised around $150 million from Siebel and outside investors. The issues that Siebel Energy Institute will be trying to solve are similar to those his company is tackling.